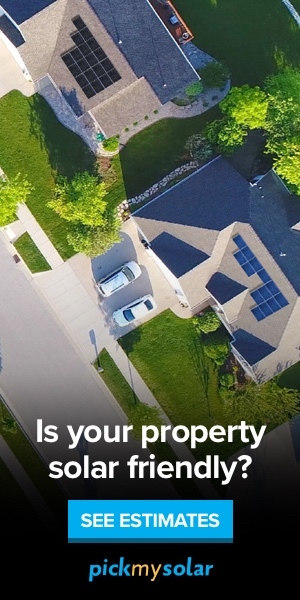 If you had to date the Great Recession, you might say it started in September 2008 when Lehman Brothers vaporized over a weekend and a massive mortgage-based Ponzi scheme began to go down. By 2008, however, the majority of American workers had already endured a 40-year decline in wages, security, and hope — a Long Recession of their own. In the 1960s, I met a young man about to be discharged from the Army and then, by happenstance, caught up with him again in each of the next two decades. Though he died two months before the Lehman Brothers collapse, those brief encounters taught me how the Long Recession led directly to our Great Recession. In the late 1960s, I was working at an antiwar coffee house near an army base from which soldiers shipped out to Vietnam. One gangly young man, recently back from “the Nam,” was particularly handy and would fix our record player or make our old mimeograph machine run more smoothly. He rarely spoke about the war, except to say that his company had stayed stoned the whole time. “Our motto,” he once told me, “was ‘let’s not and say we did.’” Duane had no intention of becoming a professional Vietnam vet like John Kerry when discharged. His plan was to return home to Cleveland and make up for time missed in the civilian counterculture of that era. I often sat with him during my breaks, enjoying his warmth and his self-aware sense of humor. But thousands of GIs passed through the coffee house and, to be honest, I didn’t really notice when he left. In the early 1970s, General Motors set up the fastest auto assembly line in the world in Lordstown, Ohio, and staffed it with workers whose average age was 24. GM’s management hoped that such healthy, inexperienced workers could handle 101 cars an hour without balking the way more established autoworkers might. What GM got instead of balkiness was a series of slowdowns and snafus that management labeled systematic “sabotage” until they realized that the word hurt car sales. I visited Lordstown the week before a strike vote was to be taken, amid national speculation about whether a generation of “hippy autoworkers” could “humanize the assembly line” and so change forever the way America worked. On a guided tour of the plant, I was surprised to spot Duane shooting radios into cars with an air gun. He recognized me and slipped me a note with his phone number. And what did he think was next? “Maybe we’ll go live on the land,” he told me. If that didn’t pan out, he said that he’d look for a job someplace less regimented, someplace where he’d get to do something “worthwhile.” To Duane, worthwhile work didn’t necessarily mean launching a space shuttle or curing cancer. It meant getting to see what he’d actually accomplished — like those repairs on our mimeo machine back at the coffee house — instead of performing repetitive snaps, twists, and squirts on cars that moved past him every 36 seconds. When Duane and his friends talked about quitting well-paying jobs, they weren’t just blowing off steam. In those years, there was enough work around that if a friend moved to Atlanta or there was a band you liked in Cincinnati, you could hitchhike there and find a job in a day or two that would cover your rent and food. That, of course, made it harder to run a business. GM echoed many other U.S. employers in its complaints about absenteeism and high turnover among young workers. In retrospect, this was probably the moment when many U.S. manufacturers began looking around to see just what could be done about their labor problem. But neither Duane nor I had any premonition of the outsourcing and offshoring that would start the Great Recession decades early for so many working families. For us, it was still a time when jobs abounded and Americans talked not about finding work, but “humanizing” it. In the mid-1980s, I spoke at a university in Michigan and once again spotted Duane — this time in the audience. After the talk, we chatted and I asked him to come out with the professors who’d sponsored my lecture, but he had to collect his children from school and drop them off with the babysitter in time to get to his late afternoon shift. His wife, he told me, would pick them up when her day shift ended. “It’s a tighter maneuver than my company in Nam ever pulled off,” he quipped. In the brief moments we had, Duane filled me in on his work life. He hadn’t gone back to the land, but he no longer worked in the auto industry either. “Too many lay-offs” was his summary of the intervening years. In order to “keep ahead of it,” he’d upgraded and become a skilled machinist. He had, in fact, continued to upgrade his skills to the point where, as he explained, “I program the machines that program the other machinists.” Then he shrugged as if to say: What’re you gonna do? At that time, computers were just being introduced into machine shops and had the effect of taking planning away from the operators at their benches and centralizing a lot of the thinking about production in a management office or planning department. Duane understood perfectly well that he was “keeping ahead of it” by using his own skills to de-skill others, hence that apologetic shrug. His wife’s job was being similarly automated. She was a data processor at an insurance company and regularly came home with a headache from staring into the era’s immobile, blinking CRT screens. They had little choice, though. By then, two incomes were needed to maintain anything like a middle-class home. In the summer of 2008, the phone rang and a man’s voice began to explain to me that he and his sisters were contacting people whose names they had found in their father’s address book to let them know that he had passed away. Duane had died suddenly in Arizona. He’d moved there a few years earlier to work in a shop that, his son told me, had something to do with industrial lasers (“keeping ahead of it” to the end). The funeral was scheduled for a weekend and because of Duane’s handiwork, there was plenty of room for out-of-town guests, so his son assured me. In his Arizona home, “Dad built these beautiful built-in sleeping spaces.” His sisters, he mentioned, were toying with the idea of moving to the house because they couldn’t imagine a stranger fully appreciating their father’s work. They were even exploring the employment situation out there. One was then a medical receptionist, the other a delivery truck driver. Two months later, the economy crashed. It wasn’t exactly the moment to give up steady jobs. By then, the Arizona real-estate bubble had fully burst, leaving the house, with all their father’s beautiful handiwork, “underwater.” Even if they could sell it at a reasonable post-crash price, they’d still owe the bank more than $200,000. As his inheritance, all Duane had left was that house, a $15,000 death benefit, and $6,000 in credit card debt. His children had no way to keep paying the mortgage, and so, on the advice of a lawyer, they mailed the keys to the bank and walked away. I thought back to the G.I. coffee house and Duane’s quips about his hapless army unit. Yes, were he around, he might indeed have made a joke about a hapless American worker trudging steadily up an incline, who, like his mortgaged house, somehow wound up underwater anyway, and he probably would have made it come out funny, too — sort of. This is not to say that Duane led either a deprived or a worthless life. His estate might have fallen victim to the economic meltdown of 2008, but he himself had worked steadily at increasingly skilled and perhaps even “worthwhile” jobs. He had raised three children who still admired their father. And he seems to have retained his self-aware but not self-deprecating humor to the end. On the other hand, here was a working man, part of a two-income family, who had kept ahead of off-shoring, outsourcing, and automation by regularly retraining himself. He worked hard for four decades, yet died with no savings, negative equity in his house, and credit-card debt. Despite his growing set of skills, Duane’s income seems not to have risen significantly over his lifetime. He was, it seems, always close to the edge. Of course, I can hardly claim to have known him well. Perhaps he squandered his money on secret vices, but the likelihood that his income simply stagnated over four decades certainly fit a national pattern. Between 1971 and 2007, real hourly wages in the U.S. rose by only 4%. (That’s not 4% a year, but 4% over 36 years!) During those same decades, productivity essentially doubled, increasing by 99%. In other words, the average worker’s productivity rose 25 times more than his or her pay. This was, of course, a bonanza for corporations and for the richest Americans. In 1976, the top 1% of U.S. families held 19% of the country’s wealth. By 2000, they held 40% of it. In those same years, 58% of every dollar of income growth went to the top 1%. There was, however, one small problem: we Americans sell to one another more than 70% of what we produce. If the majority of American workers were producing more without earning more, who was going to buy all the stuff? CEOs and financiers were desperate to answer that question, for during those years of high productivity and low wages, immense profits and “returns” kept accumulating in brokerage accounts and banks. But a bank can’t keep its money in the bank. Under the pressure of those swelling piles of capital, the answer they offered to worker-consumers like Duane was: instead of paying you enough to buy what you produce, we’ll lend you the money. First, they loaned for big-ticket items: cars, homes, college educations; then, through credit cards, for everyday household expenses. As we came to realize after the meltdown of 2008, the ultimate Ponzi scheme of the era would involve bundling and reselling mortgage loans made to people who couldn’t afford houses in the first place. In fact, creative financial spinning had kept this unbalanced vehicle upright for a remarkably long time. Nonetheless, like any other Ponzi scheme it eventually collapsed, and that’s when Duane’s long recession turned into the world’s Great Recession. 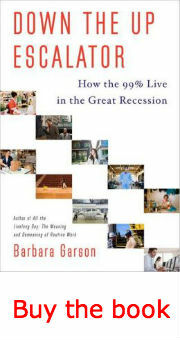 Barbara Garson is the author of a series of books describing American working lives at historical turning points, including All the Livelong Day (1975), The Electronic Sweatshop (1988), and Money Makes the World Go Around (2001). Her new book, just published, is Down the Up Escalator: How the 99% Live in the Great Recession (Doubleday).